The chaotic way in which Blackburn Rovers has been run under the ownership of Venky’s is further exposed today by the revelation that transfer policy at the club in the past year has been partly informed by tips from fans via Facebook. Vineeth Rao, a director at the club and Venky’s most senior Indian representative at Ewood Park for the past 18 months, asked supporters he befriended on the social networking site which players Rovers should buy and sell. Kept fans he’d never met up to date with behind the scenes transfer moves. Asked fans for their views on players as diverse as Spanish striker Raul and Romanian forward Ciprian Marica, both linked to Rovers although neither joined. Told one fan the club would not be signing the Argentine striker Mariano Pavone, even as Steve Kean was still holding out hope he could hire the player last summer. The correspondence helps to confirm what has long been an open secret around Ewood Park: that Kean has been marginalised from many if not all of Rovers transfers since the end of the January 2011 transfer window. Sources both within the club and close to Kean have confirmed he was effectively cut out of many key transfer decisions at the end of January 2011 when his agent Jerome Anderson ceased having a day-to-day involvement in the club. Instead, Rovers used an assortment of executives and advisors – some with little experience of football – to identify and hire players in the transfer windows of summer 2011 and January this year. Well informed sources say transfer policy ranged from player searches on Wikipedia at one extreme to the short-term use of seasoned agent Pini Zahavi at the other. Vineeth Rao’s consultation with fans he didn’t know was part of a haphazard overall strategy. The ridiculous situation has been kept quiet by Kean so as not to embarrass the owners. In turn they have kept him in a job, for now, although his precise long-term position remains unconfirmed. Kean’s record of just 13 wins in 59 Premier League games since taking the reins from Sam Allardyce in December 2010 is the main reason supporters feel change is necessary. His record of 0.9 points per Premier League game on average is worse than any of the other top-division managers sacked during his tenure. They include Alex McLeish at Aston Villa, Neil Warnock at QPR, Steve Bruce at Sunderland, not to mention Roy Hodgson and Kenny Dalglish at Liverpool, and Andre Villas Boas at Chelsea. Some fans were also angry that Kean blamed a drink driving charge on a drink he claimed was spiked as he drank with supporters. They also feel he has been less than transparent about his own role; and the revelation that he has kept quiet while signings have been foisted upon him will only raise suspicions he is a “yes man”. Nobody from the club nor at Venky’s HQ in Pune will comment. Blackburn’s newly installed General Manager – press officer Paul Agnew – is on holiday and has not responded to calls and texts. Vineeth Rao has not responded either. Other senior staff at Ewood Park, including sporting director Simon Hunt and finance director Karen Silk, remain in the dark about what the owners plan next. They found out about Agnew’s promotion via media reports. The state of confusion at the club is also highlighted by season tickets for next season not being on sale because pricing has yet to be confirmed. Also to be confirmed is the future role of former Malaysia player turned TV pundit, Shebby Singh, who sources say will take on an increased strategic role at Rovers shortly. Quite what that involves remains to be seen. What is clear is that Kean – for all the staunch support of Venky’s matriarch Anuradha Desai – has never had complete control of player matters. The case of Pavone involved the most clear cut difference of opinion between Kean and Venky’s, who didn’t want to have anything to do with the player because they didn’t want to deal with some of his advisors, sources say. Instead Vineeth Rao and others in the ‘transfer team’ did a deal to bring Scottish striker David Goodwillie to the club. “Kean didn’t want Goodwillie, the same as he didn’t want several others,” a source says. One source says Kean declined to call Goodwillie to try to persuade him to join as he wanted Pavone instead. 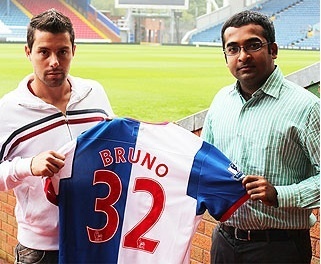 Another player who joined Rovers on the advice of someone other than Kean was Bruno Ribeiro (pictured left with Vineeth Rao). Ribeiro’s transfer was reported on the Rovers website here. In fact Ribeiro has yet to play a single minute for Rovers in a year, in any competition. Kean’s precise long-term role at Ewood Park remains uncertain. Most people at the club and at Venky’s HQ in Pune have urged Mrs Desai to sack him. Sacked deputy chief executive Paul Hunt urged that action in December. Vineeth Rao has done so on several occasions, as has Simon Hunt, both Mrs Desai’s brothers and a range of other advisors. To no avail. But Desai has now promoted Agnew, Kean’s biggest ally at the club, to General Manager, which suggests Kean is safe for now, in some role or other. Meanwhile, Sportingintelligence can reveal that a fans’ group, the Blackburn Rovers Action Group, have written to Jermome Anderson asking if he can throw light on what’s happening inside their club. It is understood that have asked whether Anderson himself – Kean’s agent – drew up Kean’s managerial contract while he was still closely advising the owners, as well as for details about Kean’s drink driving case. News of that was overshadowed slightly by the coincidental timing on exactly the same day – 17 May 2011 – of a report dealing with another Ewood Park story. Sportingintelligence understands the BRAC has asked Anderson for help in finding out details about the club’s transfer policy, including why the January 2011 move of Mauro Formica was initially stalled due to “third party ownership” concerns. Anderson has yet to reply to the supporters and has declined to comment. Representatives of the Action Group have already met with Premier League chief executive Richard Scudamore to ask questions and outline concerns over the way Rovers have been run. On Wednesday they will air their concerns in a private meeting with Sports Minister Hugh Robertson. But as the weeks to the new season tick by, Blackburn’s future remains as shrouded in mystery as ever. Addition to story, 3.15pm on 11 June. Sportingintelligence was aware of at least three individual separate fans who had been canvassed for views via Facebook by Vineeth Rao. Since publication of this story earlier today, others have already come forward to say they too had online discussions with VR about players via Facebook. And a partial transcript of one exchange is linked here.